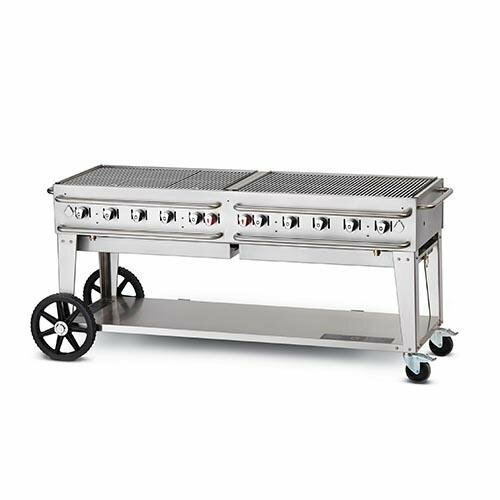 The Crown Verity CV-RCB-72RDP-SI-LP mobile outdoor grill is powered by liquid propane and includes tank holders for 20-pound propane tanks. Roll domes keep heat over food so it quickly cooks and holds bun racks that adjust to four heights to warm bread and other foods without the risk of burning on the grill. The stainless steel design holds up in high volume use and transporting since it is heavy-duty. 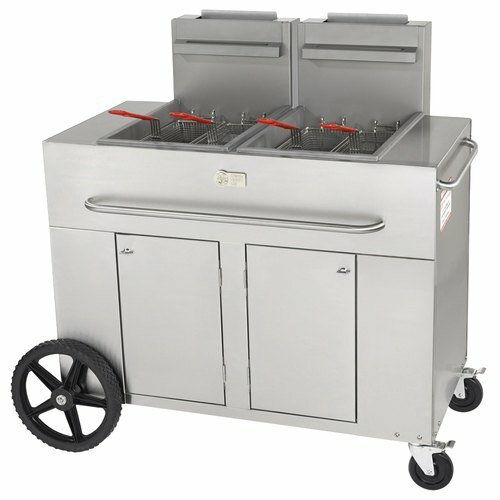 Our Double Tank Fryer is designed to cook high volumes of product in a short period of time. 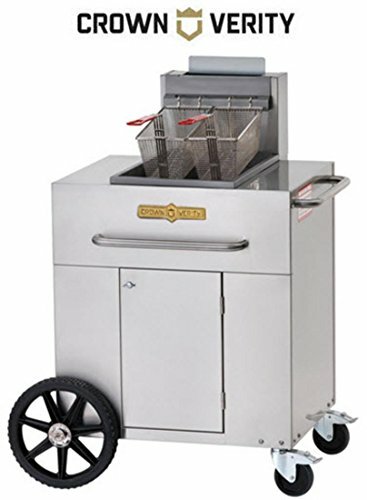 This fryer is for outdoor use only. With large 14" wheels it is portable and easy to move making it ideal for caterers, party rentals, and special events. Features: BTU's: 90,000 Per Tank. Fuel Type: Liquid Propane. Galvanized steel fry tank cover(s). Stainless steel cabinet, fry tanks(s). Two 14" wheels and two total lock casters. Two fry baskets per tank with plastic coated handles. Tank holder(s) to hold 30 Lb. vertical propane tank(s). Full port ball type drain valve with drain pipe extension. Three heat exchanger tubes per tank positioned for easy cleaning. Specifications: Overall Dimensions: 53" (W) x 30.5" (D) x 48.75" (H). Thermostat: 200 Deg F - 400 Deg F. Capacity: 40 lbs. per tank. 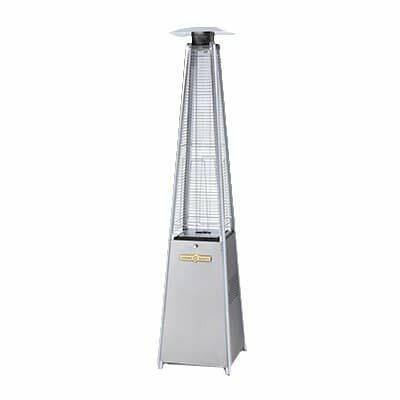 The Crown Verity 2670-SS portable patio heater is constructed from stainless steel and aluminum for durability. This unit is heated with propane and can accommodate a 20- or 30-pound tank. There is a variable gas control valve and a push-button ignition that makes the heater easy to use. A knob lets you control the height of the flame. This fused, quartz glass is tempered for strength. The Crown Verity 2670-SS portable patio heater comes with a wheel kit that makes moving the heater easy. The Crown Verity CYL-20 propane tank provides propane gas to patio heaters, steamers, griddles, MCB grills, and TG-3 grills. This unit is compatible with the 5131 hose and regulator. The Crown Verity CYL-20 propane tank has a capacity of 20 pounds. 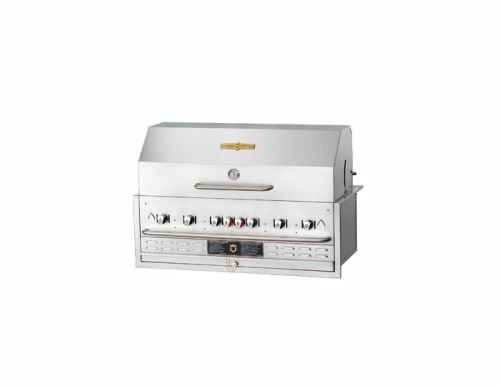 The Crown Verity CV-RCB-72WGP-SI-LP mobile outdoor grill operates with propane. There are storage brackets for 20-pound propane tanks to be held in place on the back of the unit. The front and sides of this model have crash bars mounted to provide protection, especially while transporting. There are water pans with built-in drain ports that add moisture to food, facilitate cleaning, and help eliminate grease fires. Quality is built into every Crown Verity stainless steel grill. 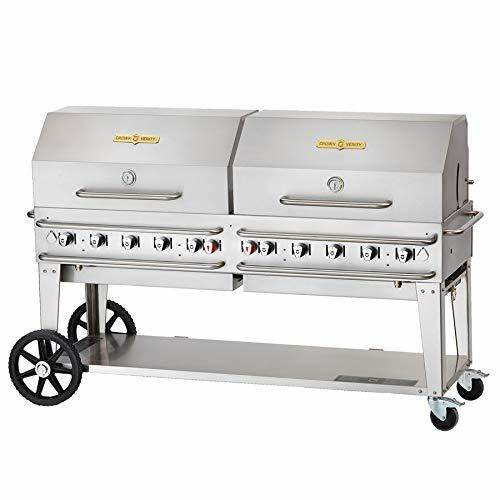 Now you can make that quality permanent by installing a 36" or 48" grill into your outdoor cooking area. It's a finished, professional look for the outdoor cook. Includes: Roll Dome, Bun Rack and BBQ Cover. Features: BTU: 99,000. Burners: 6. Fuel Type: Propane. 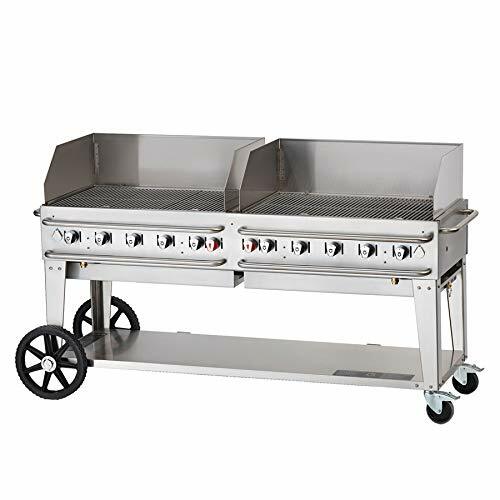 Gas grill constructed of 304 stainless steel including grids, burners and all fasteners. 16 ga stainless steel radiants that remain in place during transportation and cleaning. Ready to use: ships completely assembled and comes with an insert shell ready to drop into an island. Specifications: Overall Dimensions: 51.5" (W) x 27" (D) x 17.75" (H). Cooking Surface: 46" (W) x 21" (D). Looking for more Crown Verity Propane Tanks similar ideas? Try to explore these searches: Kolpin Rhino, 200a Lug Load, and Facial Care Tool. 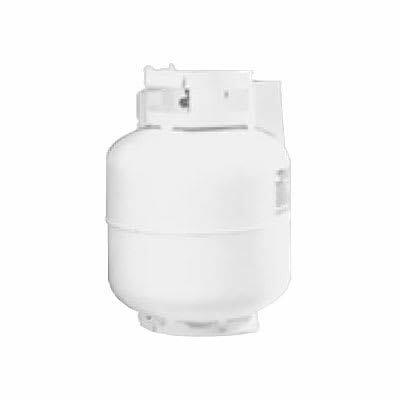 Look at latest related video about Crown Verity Propane Tanks. Shopwizion.com is the smartest way for online shopping: compare prices of leading online shops for best deals around the web. 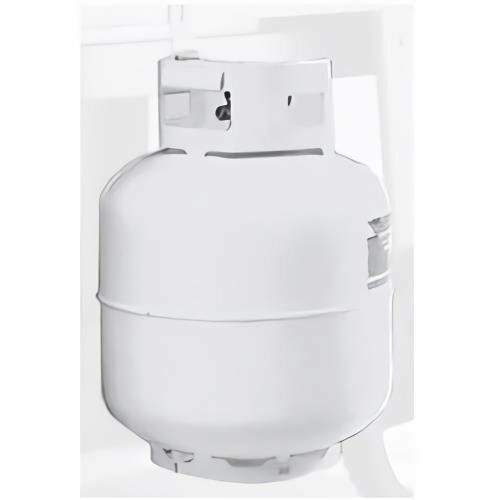 Don't miss TOP Crown Verity Propane Tanks deals, updated daily.